On the night of March 23rd, 2018 about 9:30 pm I walked outside in the gravel outside my home and felt a sharp stick in the little toe of my left foot. I was wearing Nike flip-flops which have a very thick sole. I thought I stepped on a sticker and looked down, and something was attached to my left foot. I shook my foot and flipped whatever it was off. The scorpion started crawling back toward me and I ran into the house. My foot immediately started hurting painfully. I woke my husband up and by the time we left the house for the emergency room (ER) my foot had started turning black. It was extremely painful. The ER is about 15 miles from my home. I sat in the ER for three hours with no attention except for having my vitals taken. By the time I did see the ER doctor my leg had turned black from my groin to my little toe and was extremely painful and swollen along a vein that goes from groin to foot. The ER doctor ordered an ultra sound to make sure there was no blood clot and sent me home with hydrocodone and ibuprofen and antibiotic instructions to come back if not better in three days. By Sunday the swelling and bleeding under the skin was worse so I opted to go to the ER about 50 miles from my home, and once again had an ultrasound of my leg which did not show the veins as the swelling was too much. I was again sent home with a prescription for more ibuprofen. By Thursday which had been one week my leg was worse and the pain almost unbearable even with the pain medicines. And I stared throwing up so once again I went to the ER and this time the ER doctor admitted me and they started an IV with blood draws about 3 times a day. By Sunday my red corpuscles had dropped to 6.8 so my attending doctor ordered a blood transfusion after which my blood corpuscles came up to 9.9 then immediately dropped back to 7. By Monday my blood had recouped on its own to 9.9 and all the time I was in the hospital I was receiving 100 cc per hour of IV solutions. I was able to come home. My leg has cleared up with only a small amount of discoloration in my heel but is still swelling during the day. I attribute the astute care I received from my attending doctor at the hospital for saving my life. I live in an American community which has not been in compliance with state drinking water standards since as far back as on-line records go, 2004. One of the wells was closed when found to be infected with E. coli. The timeline for restoration of drinking water is unknown; the community has just turned in a 2016 report documenting being overdue with compliance. Since last June I've had diarrhea, elevated blood pressure, night sweats and blood in my urine (hematuria). In December, E. coli was found in my urine and I was treated with Macrobid, which cleared up both the excruciating bladder infection and the diarrhea for a few weeks. Last week the diarrhea returned, my urine was tested, still blood in it, still painful, and the doctor (a gynecologist nurse practitioner) said to ignore it (and that the high blood pressure which suddenly appeared over the summer must be due to the pizza I eat a couple times a week, given that I don't use salt as a food additive). The health department in this county was privatized years ago. I'll call them anyway. They should check this whole community for E. coli, instead of letting doctors diagnose gluten allergies and Crohn's and all sorts of other excuses for loose stool. I have been telling doctors for years that it feels as though my brain wasn't getting enough oxygen. No response! For years I was in a workout program at a gym, twice a week. Occasionally I would have to skip working out after the first of the workout pushed my heart rate up and instead of that increasing my blood pressure, my blood pressure dropped so that lying down was the only way to prevent falling down! For the last 3 or 4 years my balance has gotten worse and worse, I experience lightheadedness and a sense of floating more and more frequently. The room occasionally takes a quick spin or my walking is suddenly in the wrong direction. I claim that there is a little man who walks behind me and gives me a shove to take a wrong step every so often. That little man doesn't bother any more as I am dizzy or lightheaded or floating most of the time from rising in the morning until I have been up for a while, often during the day for short periods and now, for longer and longer periods, usually following a short time trying to do the exercises proposed by my physical therapist. My heart rate is up, my blood pressure is down and I can't continue. No doctor has thought it worth pursuing! My son was found unconscious in May 2013 due to 13 brain lesions. Original diagnosis was brain cancer but it was found to be bacterial after the biopsy. We were told he would not survive. He had to learn to talk, eat and walk after spending 75 days in hospital. The lesions they could access by surgery were drained. He still has an Ommaya reservoir under his scalp and quite a few scars but has made a full recovery and works full time. Never give up hope! I kept feeling like I couldn't do much and it kept getting worse. Doctor did blood test and there was no response from him. Lab didn't send test results to doctor. I assumed it as ok. Next time I saw him, he said I didn't look good. I took another blood test. Hemoglobin level was at 6. Not good at all. I entered hospital and had blood transfusion and more. After many tests, results suggested my stomach was not absorbing iron from foods. Still getting treated and hemoglobin is up to 10.8. I feel much better a year later; takes a long time. Yes. I am 100 percent bed bug free thanks to a one-time heat treatment. It's the most effective method known to date and most exterminators offer a guarantee as well, which is great. I have bed bugs problems in my villa and I have contacted a reputed company for bed bugs control. 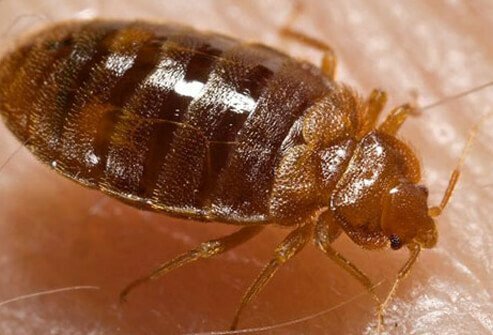 Living in the shelters and rescue missions, no, I wasn't able to treat or rid myself of bedbugs. We found an all-natural product called Bugright and it killed every crawling insect we had. It is a powder and it works. It was great to know it is safe around children and pets. Bed bug issue in my townhome is a challenge, I bombed, sprayed, Orkined, steamed and sprayed again. You have to be persistent and keep killing the little monster. I replaced mattresses and will not have delivered new ones until after the retreat by the Orkin Man. I may rip up the carpet if this does not work. I am not paying 3K to heat treat, I would rather buy new flooring. We got rid of the rest of the bedbugs in our bedroom in a strange way. We tore out the infested carpet and put in vinyl, but got the wrong adhesive for the vinyl, something meant for countertops. It had a terrible chemical smell, and all the rest of the bugs in the baseboards etc. were killed in hours. The clothing, I washed or put through the clothes dryer, and stored papers went in the freezer for a week. About 1 year ago, I noticed something crawling in our bed, I instantly googled bed bugs and realized that's what we had. We were sleeping on a bed given to us by my brother-in-law...and we had a major infestation in our room, but no where else. We burned the mattress, box spring and frame, and bought on-line chemicals to treat our room. Bought a new bed set, and they came back in our SON's room! TERMINIX came 10 days ago and "treated" for bed begs (they only found 1 live adult and some eggs) and today, a live one in our bed. I am SO MAD!!! I just received a low hemoglobin count of 7.6 at a health fair screening. I shared that with my doctor who called me in immediately for a full blown blood evaluation. He thought that count was a mistake since every other test came back perfectly normal. They asked me all sorts of questions but they said I look fine. He thought this was an error in the blood test result at the health fair. A few days ago I noticed a lump below my sternum and above my belly button, and the lump only appears when I am going from a lying position to getting up. As my muscles tense, the lump appears. When I saw the lump, I wondered to myself what was growing inside me. Than I did some research online (the worst thing to do) and saw it can possibly be an epigastric hernia, which I'm hoping that is all it is. We are still in the process of ridding our home of bed bugs. I have a steamer on the way. I started getting bites on me 2 days after we returned home from the Grand Canyon. I am covered in bedbug bites. I am still exterminating and bombing my home. I have been chewed up by this filthy bugs. But my boyfriend has only been bitten once… and he sleeps right next to me! Does anyone know why they bite some people and then some people they don't! Six months after moving into a new apartment, we found we were infested. They were in the walls and in every apartment in our building despite monthly pest control. After research and armed with a hand held steam cleaner we cut the invasion down drastically. The steam cleaner could not reach everywhere but the heat did even kill the unhatched bugs in their nest. Our next step was to buy 5 lbs of Diatomaceous Earth (often referred to as "DE") is an off white talc-like powder that is the fossilized remains of marine phytoplankton. When sprinkled on a bug that has an exoskeleton (such as bed bugs, roaches, ants or fleas) it gets caught between their exoskeleton joints. As they move, the diatomaceous earth acts like razor blades and cuts them up. They dehydrate and die. DE is totally nontoxic. There is no buildup of tolerance like there is to poisons because the method of killing is PHYSICAL, not chemical. But it doesn't hurt mammals. We can eat it. Make sure that you ONLY get FOOD GRADE diatomaceous earth. Other forms have additives that are harmful to all mammals. It won't hurt pets. Internally it will kill parasites; rubbed on fur it will kill other parasites like fleas. It is cheap and a little goes a very long way. One strange thing about diatomaceous earth is that for it to work on killing bugs, you have to keep it dry. Even morning dew can make diatomaceous earth ineffective, so you might have to reapply in areas that might get damp. I suggest using light applications as it spreads as you walk thru it and such. One month and we never saw neither another, nor any other bugs. What's bad is I have been asked by pest control not to tell anyone about this as it would hurt their business. Actually, the gov should be letting people know; I can't help but wonder who is getting their pockets lined in green! My symptoms started out as red swollen bumps, very itchy, and when scratched, would sting and burn until I couldn't take it anymore. Later in the day after more scratching, burning, and irritability, I would get headaches with nauseous feelings and areas of my body would tingle, twitch, and go numb. I never had this feeling before the bites started. I reported this to my apartment and they pretended to have no knowledge of the fact. They Lied! Be careful and always ask about the apartment or room before taking possession. I went to the Hospital for these bites because I had several on the posterior side of my body, arm, legs, ankles, and side. It leaves mental, physical, and emotional scars. I can't sleep at night because I constantly get up checking to see if I'm being bit. I have been trying to get rid of bedbugs for two years now. I have been through two exterminator's including Orkin, which cost me over $1400, Not to mention threw away bed sets, couches, bought numerous mattress covers, and vacuumed and washed everything so many times. The problem got a little better with orkin, but now I have seen three and I have a horrible rash due to allergic reaction to the bites. I own this house and can't afford to move. I am considering the heat treatment but I can't afford the expensive cost, especially if I am going to waste my money again. Why isn't there being something done to put an end to this nationwide epidemic of bedbugs? Diseases such as HIV, HEPATITIS A, B, & C or others usually are killed once exposed to air within seconds from studies I've read. 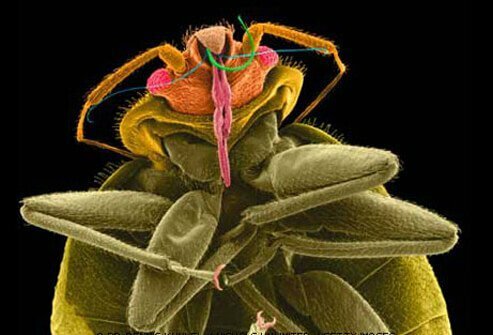 The question though is, if the blood from the person that is bitten is stored and protected by air in the bedbug until it bites again or is killed by hand (which squirts out a large amount of stored blood) that blood would be carrying infected blood and then transferred to the next person bitten. A bug that bites me could have bitten 2,5,10 people before me and the blood would not yet be airborn so, it could still be carrying any disease that the previous people may have had. The blood doesn't get exposed to air until the bug is finally killed. Any information on how to rid myself and family of this problem of bedbugs and the strongest spray available for consumers to buy would be deeply appreciated. Bedbugs can definitely have blood to blood contact. I got rid of bed bugs with a food grade product called Diatomaceous Earth DE. It is safe , non toxic , and very very cheap. You can buy it at feed and grain stores. Google it and read about it and learn all the benefits of it. It was the only thing that got rid of the bed bugs , fleas and ticks as well. I am a property manager. I have found that the most effective way to kill bed bugs is by heating the home or apartment to 140 degrees for 24 hours. It can be dangerous though, you have to rent heaters to heat the home and keep checking to prevent a fire. It is also difficult with someone living in the home since they can have items that can be damaged by heat. I hope this helps. The bedbugs were biting my legs from the knee down. Before going to bed I covered my legs from the knee down with a generous coating of baby oil. (Don't rub the baby oil in. Just let it set on top of your skin). During the night the bed bugs got stuck in the oil and took in the oil instead of my blood and they died. The next morning there were many bed bugs dead on my skin and in the bed. I brushed them off. It took 3 nights of coating my legs to get them all. We went to a water park hotel Easter weekend of 2011 and didn't realize we brought home bedbugs with us until July. My poor little toddler was getting eaten alive. We burned the mattress and box spring and made sure all of our beds had bed bug rated encasements. We bug bombed our house on a regular basis and used several different sprays specified for bedbugs, and heated the rooms up to over 100 degrees for most of a day. We used lavender soap to help repel. Well it is now February, 2012, and we still have the little pests. I got rid of my bed bugs by going to a feed store (animal) and bought Diatomaceous Earth. Sprinkled it all over and took a squeeze pointed bottle and put it all around the baseboards in my 3000 square ft home, even sprinkled it on the furniture. Will not harm you, kids or pets. Trust me it works just as long as you don't get it wet. Also, before you vacuum put some DE in it. I've had no problems and haven't seen any bugs. It is not expensive to buy. I have contacted bed bugs from a motel in Belleville Ontario. I have gotten treatment from family Dr and bed and house pray from drug store was treated for a few weeks as poison ivy that just kept getting worse with a very itchy red rash and many bites all over my body. Just bought a new box spring and mattress two months before all of this. I got a few bites while at this motel and thought it was mosquito bites as we were out that night. Now we think it is all under control after treating and spaying and bleach the floors a lot of work to get under control. Bed Bugs hate heat. We used a hair blow dryer to get rid of the bugs. We blew beds, mattress, and outlet with the heat from the dryer and it was like spraying Raid on roaches. Very affective, but very time consuming. It took about 6 months to rid our 3 bedroom home of the bed bugs. Good luck! I would like to know what is the best insecticide that you can buy to get rid of bed bugs I bought the mattress cover, but I want to make sure that I'm rid of them. Any help is highly appreciated. To get rid of bedbugs, I used an insecticide to spray around the edges of my mattress and box. After it dried, I used my iron to steam away any remaining bugs on the mattress. It was my own personal idea, and it worked. No more bedbugs after that. After getting bed bugs from a family, I put hair gel on my skin to get rid of the bugs. Simply rub generous amounts of gel over skin before bed next thing you know the bugs drowned in the hair gel as you sleep at night.